Now you can share those precious memories shot on your AVCHD camcorders on your favorite digital devices. ImTOO AVCHD Converter can convert AVCHD videos (MTS, M2TS, HDV, MOD) to popular video (AVI, MPEG, WMV, DivX, MP4, MKV, RM, MOV, XviD, 3GP, FLV, SWF) and High-definition (HD) formats (incl. MPEG-4 TS HD, MPEG-2 TS HD, Quick Time HD, WMV HD). With this AVCHD video converter, you can also extract audio from videos, capture video images. It also comes with a host of great video-editing tools. Download the ImTOO AVCHD Converter for FREE and relive those timeless moments on your iPod, iPhone, Apple TV, PSP, PS3, Xbox, mobile phone and many other devices. Convert MTS/M2TS/MOD videos shot on AVCHD camcorders to AVI, MPEG, WMV, DivX, MP4, MKV, RM, MOV, XviD, 3GP, FLV, SWF video and HD video formats. Highly compatible to convert videos shot with AVCHD camcorders or DVs including Panasonic, Sony, Hitachi, Canon and JVC (e.g. Sony HDR-CX7E AVCHD 1080i, Hitachi DZBD10HA High Definition Camcorder, Canon HG10 AVCHD 40GB High Definition Camcorder, Panasonic HDC-SD9GK). Extract audio from AVCHD videos and convert them to MP3, WMA, WAV, RA, M4A, AAC, AC3, OGG audio. With this software, you can convert videos captured on your camcorder to picture files (JPG, PNG, GIF or BMP format). Trim an AVCHD video to retain the desired clips; choose to export them singly or as a merged whole. 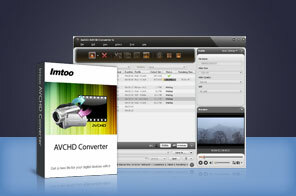 ImTOO AVCHD Converter can add picture and text watermarks, subtitles and soundtrack, as well as artistic effects such as "old film", "snowflake", "mosaic", "sand", and "negative" to videos. Convert multiple AVCHD videos simultaneously at high speed. Supports GPU acceleration when output to MKV format. Supports adding multiple tracks into a single file when output to MKV format. Added High Definition video profile for iPad 2. Support more devices like Motorola XOOM and Samsung P1000. Enjoy AVCHD videos on iPod, iPhone, Apple TV, PSP, PS3, Xbox, BlackBerry, iRiver, Creative Zen, mobile phone, and other media devices. Transfer converted AVCHD videos to iPad, iPod, iPhone 4, PSP and even iTunes directly. Convert AVCHD videos at up to 5x faster speed with NVIDIA CUDA & ATI Stream encoding technology. Merge multiple video clips or pictures together and inset transitional effects to them. Crop a video frame to remove unwanted borders, commercial logos, or anything else you dislike. Split a large video into several smaller clips with customized split time or size. Allows you to adjust video frame brightness, contrast and saturation. Get the output file size you want precisely with the aid of the Bitrate Calculator. Preview the original and the edited videos in real time to get the desired results. Classified output parameters into different categories. Configure video and audio parameters including bit rate, frame rate, sample rate, codec, and audio channel; save new settings as your own conversion profile. Convert a source file into several formats simultaneously. Ability to auto exit, shut down, hibernate, stand by your system after a conversion is completed to conserve energy. Run conversions in the background to minimize CPU usage. Preview video files in the resizable player and take snapshots of video images during preview and save them as JPG, PNG, GIF or BMP file. Multiple skins and interface languages available: English, German, French, Chinese and Japanese. Tutorial : How to convert AVCHD videos to HD and common videos with ImTOO AVCHD Converter? Best video joiner software to join AVI, MPEG, WMV, 3GP, etc. videos according to your needs. A professional movie maker software lets you cut, join, edit, and convert almost video files easily. Convert AVI, MPEG, WMV, DivX, MP4, H.264/AVC, AVCHD, MKV, etc. to FLV video; convert FLV to AVI, MPEG, WMV, and many other formats. All-in-one video converter to convert among almost all video and audio formats. HD Video Editing - How to edit HD (High Definition) videos? How to convert M2TS to AVI? How to convert MOD to WMV with MOD to WMV Converter? How to convert M2TS to QuickTime MOV file? How to convert M2TS to WMV (Windows Media Video) file? How to convert M2TS to MPEG?